After reading Pasquale Venuti’s “The Zeroing In – TomorrowTooth Consensus”, This patient came to mind. By applying these principles and the teaching of David Clark, I wanted to share this unusual case. It is in progress – the final pic is immediate post-operative, and the patient is going back to the periodontist. 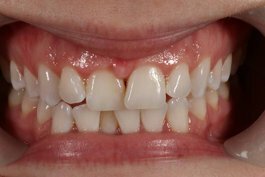 The patient did not like the look of the black triangle between her central incisors. 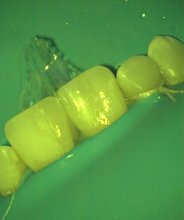 The patient was under the care of a periodontist, and would not return again to her orthodontist. She wanted to know if there was a minimally-invasive option. 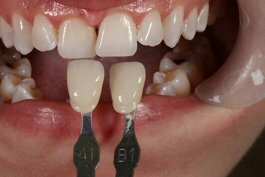 When performing non-invasive, ADDITIVE composite cases, such as include black triangle resolutions and diastema closures, the impact of the AquaCare is huge, both by the removal of biofilm and also in preparing the enamel surfaces for adhesive dentistry. I will often use a combination of sodium bicarbonate and 29 micron aluminium oxide to accomplish this. 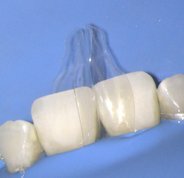 The case was completed with A-101 Bioclear Matrices (full protocol). The only preparation, outside of air abrasion, was sanding of the contact between the centrals to allow full seating of the trimmed matrices. 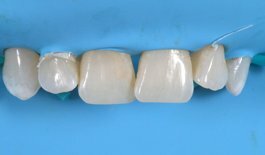 The gingival zenith of #8 (11) was recontoured with a diode laser to aid the periodontist (hence the redness). Will post follow-up photos. 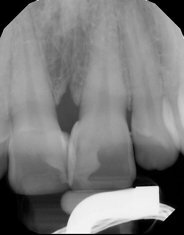 Admittedly, it does look a bit unusual, and certainly ortho would have been an ideal starting point, however this treatment addresses the patient’s concerns and will not negatively impact the patient’s health (please see the final radiograph). 7. Immediate result following gingivectomy of #8 (11). Needs some refinement, which will be addressed after discussion with the periodontist. 8. Post-operative radiograph. Note the resultant contours from the matrices, as well as the palatal volume at #8 due to the unusual positioning of the teeth.